Japan’s biggest banks have navigated through a year of negative interest rates and choppy financial markets with their profits intact, thanks at least in part to Donald Trump. When the Bank of Japan announced the policy on Jan. 29 last year, shareholders, analysts and executives gave it a firm thumbs down. Lenders’ shares tumbled in the ensuing months as investors deduced that the BOJ’s move would squeeze already-depressed interest income and do little to spur credit demand. A year later, Mitsubishi UFJ Financial Group Inc., Sumitomo Mitsui Financial Group Inc. and Mizuho Financial Group Inc. are on course to exceed their fiscal-year profit goals, having all beaten analysts’ estimates for third-quarter earnings. Surging global bond yields and market volatility since Trump’s November election victory have been a boon to the banks’ fixed-income trading, helping to offset weak lending profitability, the results showed. Other tailwinds include a weaker yen, which has fueled inflation expectations and prompted economists to predict that the BOJ’s monetary easing is over. And bank executives have welcomed Trump’s moves to relax financial regulations in the U.S., where the three firms have operations. Bank shares jumped in Tokyo trading on Monday morning, with MUFG climbing as much as 5.2 percent, the most in two months. The lender, which has the largest American presence among Japanese banks, has surged 43 percent since the Nov. 8 U.S. election. The benchmark Topix index has gained 12 percent in that time. Combined net income at the Tokyo-based banks fell 8.1 percent in the nine months ended Dec. 31 percent from a year earlier to 1.8 trillion yen ($16 billion). That represents 85 percent progress toward their aggregate target of 2.15 trillion yen for the year ending March, and 81 percent of their previous year’s earnings of 2.27 trillion yen. Net income rose 0.3 percent from a year earlier to 628.4 billion yen. Net interest income slid 3.1 percent. Bond and securities trading profit jumped 70 percent. Fees and commissions dropped 1.4 percent. Credit-related costs fell to 14.1 billion yen from 62.8 billion yen a year earlier. Still, not all is rosy. Negative rates remain, even as it becomes less likely that BOJ Governor Haruhiko Kuroda will drag them further below minus 0.1 percent. As old loans mature, banks will be pressed to make new ones more cheaply. 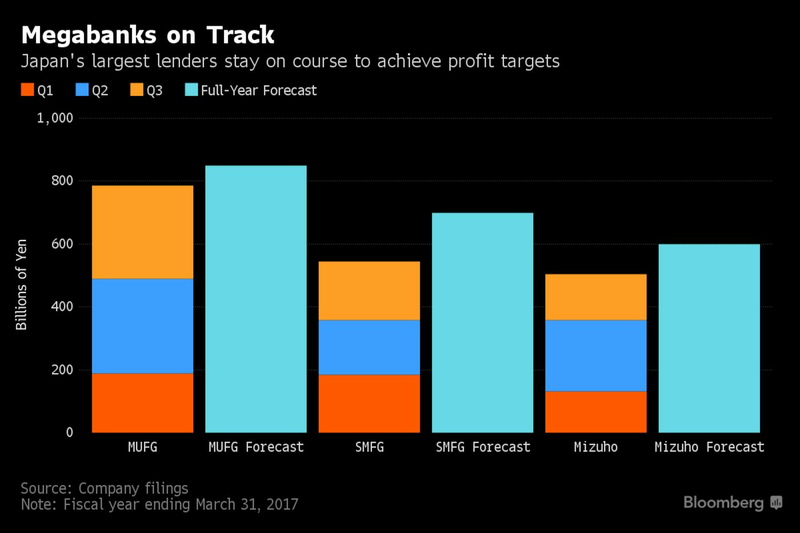 Net interest margins at the three lenders continued to shrink last quarter, with Mizuho’s reaching a record-low 0.9 percent. It also remains unclear how much the banks will benefit from Trump’s policies. Part of their profit revival has come from the weaker yen inflating earnings abroad, and the currency gained last week after Trump accused Japan of devaluing it to get a trade advantage. Sumitomo Mitsui has set up a team in the U.S. to provide research to corporate clients that are concerned about the president’s protectionist trade stance.